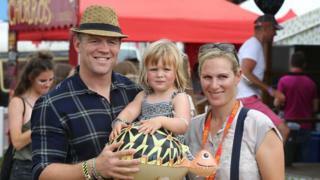 The Queen's granddaughter Zara Tindall and her husband Mike are expecting a second child, a spokeswoman said. The new baby is expected to be born in the late spring and will be the Queen and Duke of Edinburgh's sixth great-grandchild. The couple, who already have a daughter Mia who is nearly three, were said to be "thrilled" at the news. Equestrian champion Mrs Tindall and her husband, a former England rugby union player, were married in 2011. A Buckingham Palace spokesman said: "The Queen and the Duke of Edinburgh and members of the Royal Family are delighted with the news." Responding to well-wishers, Mr Tindall tweeted: "Just a quick one to say thank you for the messages. We are very very happy about the little one on its way. 2017 is already starting well!!" Mrs Tindall, who is daughter of the Princess Royal, missed out on the Rio Olympics this year after she failed to make the British Equestrian Federation's nominated rider list. The former world eventing champion helped the Great Britain team win a silver medal at London 2012. Earlier this year, Mia Tindall was pictured holding the Queen's famous black handbag when the monarch and her great-grandchildren posed for an Annie Leibovitz photograph to mark her 90th birthday. The couple's second child would be a second cousin to Prince George and Princess Charlotte. Queen’s birthday: Who are the youngest royals?